With multiple view options, the Nigeria Health Map data visualization tool drills down to state-level gains and challenges for a number of health interventions and outcomes. Results currently reflect trends from 2000 to 2013 and primarily focus on high-priority maternal and child health (MCH) indicators in Nigeria. Data may be downloaded at http://ghdx.healthdata.org/record/nigeria-maternal-and-child-health-results-2000-2013. 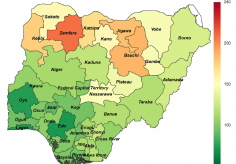 This dataset contains estimates of MCH indicators in Nigeria at state and national levels. These estimates were produced by using multiple data sources and applying complex modeling approaches. Trend estimates in this dataset include under-5 mortality, indicators of childhood nutrition (prevalence of underweight, stunting, and wasting among children under 5), and a range of MCH interventions including malaria control, childhood immunizations, and other key MCH interventions such as skilled birth attendance, exclusive breastfeeding, and prevalence of modern contraceptive use. Additional detail on the methods used to generate these state-level trends can be found in the BMC Medicine article, “Benchmarking health system performance across states in Nigeria: a systematic analysis of levels and trends in key maternal and child health interventions and outcomes, 2000–2013.” In sum, researchers extracted data from 19 surveys to generate estimates for 20 MCH interventions and outcomes for 36 states and the Federal Capital Territory from 2000 to 2013. Source-specific estimates were generated for each indicator, after which a two-step statistical model was applied using a mixed-effects model followed by Gaussian process regression to produce state-level trends. National estimates were calculated by population-weighting state values.